Lululemon Athletica inc. (LULU) started out in 1998 as a simple clothing store in Vancouver, Canada that sold yoga wear. In 2008 it hired the former co-president of Starbucks International, Christine Day, to be its CEO. Since then Lululemon has grown to be a ten billion dollar business selling athletic clothing. The brand has become a household name. In 2016 Lululemon Athletica has many segments including company operated stores as well as direct to consumer service. It has a line of apparel and accessories for women, men, and female youth. Its line of products includes pants, shorts, tops and jackets designed for healthy lifestyle activities and athletic pursuits such as yoga and running. Lululemon has approximately 360 company operated stores in the United States and Canada. A few years ago its customers complained that the pants Lululemon was selling was too transparent. It appeared that the pants passed quality control when they shouldn’t have. This raises concerns over how much the company values quality in its products. The clothing lines that Lululemon offers is meant to represent high end material and look stylish. Since customers are paying $70 or $80 for each pair of pants they expect it to be non see through. The transparency scandal resulted in about 17 percent of the yoga pants being recalled by Lululemon, which is a large amount for a clothing company. In terms of market sentiment it appears that investors are split on the outlook of (NASDAQ:LULU.) Its last quarterly financials revealed it made $0.30 of earnings per share, which was more or less in line with the Wall St. consensus. It earned $495.5 million for that quarter, which slightly beat the consensus estimate of $487.7 million. Comparable store sales, including its online business, grew 6% to start off the company’s fiscal 2016 after spiking by 11% in the previous 3 month period. Its CEO Laurent Potdevin and his executive team have projected similar results for the following year ahead. According to its own forecast the company should continue to grow its revenues in the mid-single digits range. Lately the company has sacrificed some profitability in exchange to drive more traffic to its stores and online shopping portal. Its gross margin slipped from 48% a year ago to 47% now. Its operating margin is still considered high for a clothing company but the question is how much longer can they keep this up? By comparison, in 2011 its margin was 57% of sales. As costs for the business increases due to wage inflation Lululemon will have to find new ways to add more value and charge higher prices for their products to maintain a competitive margin. 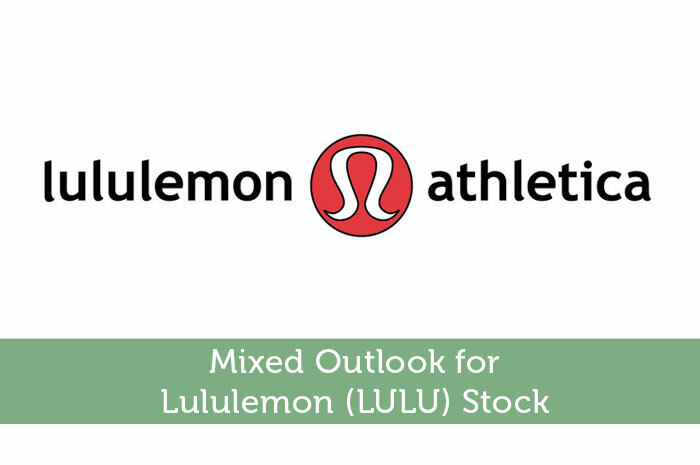 Over the next several years some analysts are project Lululemon to reach $4.6 billion in revenue and $600 million in profit. This is a possibility but one factor that could thwart its business growth is the challenging competition against other high level athletic clothing brands such as Nike or Under Armour. According to a recent Reuters stock report, there are 33 analysts covering LULU at the moment. The consensus among them is a “buy” rating, however 14 out of the 33 have a “hold” rating or less. Based on the current earnings projection I would consider LULU to be slightly overvalued by 15% or so. LULU does have strong earnings, but not enough to justify its current Price to Earnings ratio of 40x. But on Tuesday this week one investment analyst at KeyCorp boosted LULU’s target from $80.00 to $85.00 per share. The new price target puts a 10% premium over the stock’s current price. KeyCorp currently has an “overweight” rating on the apparel retailer’s stock. Some people believe LULU still have room to expand, while others would rather stay away from the yoga apparel company. This author does not hold any stocks mentioned in this post as of writing it.